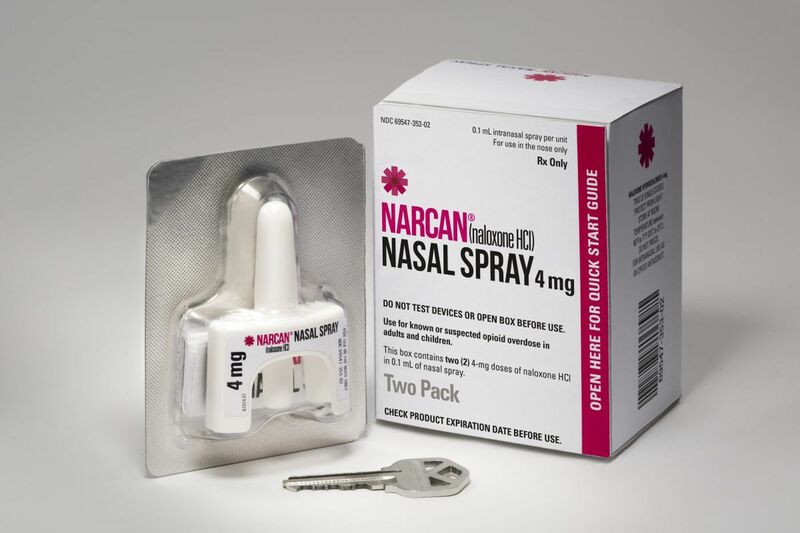 Narcan Nasal Spray, an opioid overdose antidote designed for use by people with no medical training, is made by Adapt Pharma, an Irish company with U.S. headquarters in Radnor. The Wolf administration said Thursday that it would buy 60,000 two-dose boxes for first responders. Gov. Wolf said Thursday that Pennsylvania would supply 120,000 doses of the opioid overdose reversal medication naloxone to first responders. The budget includes $5 million for bulk purchases of Narcan Nasal Spray, a consumer-brand version of the emergency antidote, administration officials said. Narcan is made by Adapt Pharma Inc., an Irish company with U.S. headquarters in Radnor. Unlike the generic, which emergency room physicians and paramedics administer by injection, the nasal spray is intended for use by people with minimal medical training, including police, ambulance crews, and friends and families of people at risk of an overdose. A "standing order" written by the state physician general two years ago allows consumers to buy it without a prescription in many pharmacies; there is a similar order in New Jersey. A box with two 4 mg doses typically retails for around $140, according to a check of local pharmacy prices online, although Thom Duddy, an Adapt Pharma spokesman, said it often is sold for less. He said that most commercial insurance plans now cover it with normal copayments, as do Medicaid and Medicare. Versions of naloxone have been among a series of medications that have provoked anger against the pharmaceutical industry due to sharp price increases in recent years. Duddy said Adapt Pharma has not changed its price — $125 per box wholesale — since Narcan went on the market in February 2016. A 40 percent discount applies to "public interest" organizations, including the state, which will purchase the medication and make it available to first responders in each county. The Pennsylvania Department of Drug and Alcohol Programs has tracked nearly 4,000 overdose reversals by police but the actual number would likely be many times that; families and buddies of drug users often administer the antidote, and physicians are urged to prescribe it to pain patients whose histories and legitimate opioid use raise their risk of an overdose. Still, more than 4,600 people died of drug overdoses in Pennsylvania in 2016, up 37 percent from the year before. The increase was driven largely by fentanyl, a powerful synthetic opioid that illicit suppliers often mix with heroin and other drugs to increase their potency and lower the cost. "Naloxone, a life-saving medication, is making a difference in the heroin and opioid epidemic in Pennsylvania," Wolf said in an afternoon news conference. He said the funding was included in the 2017-18 budget, which was approved by the General Assembly over the summer. although a revenue plan to pay for it has been at an impasse for months.